Walt Disney said it best: “If you can dream it, you can do it.” As 3D printers become more commonplace, the ever-evolving technology that makes up this field keeps experienced creators and uninformed novices alike giddy over what the future may hold. 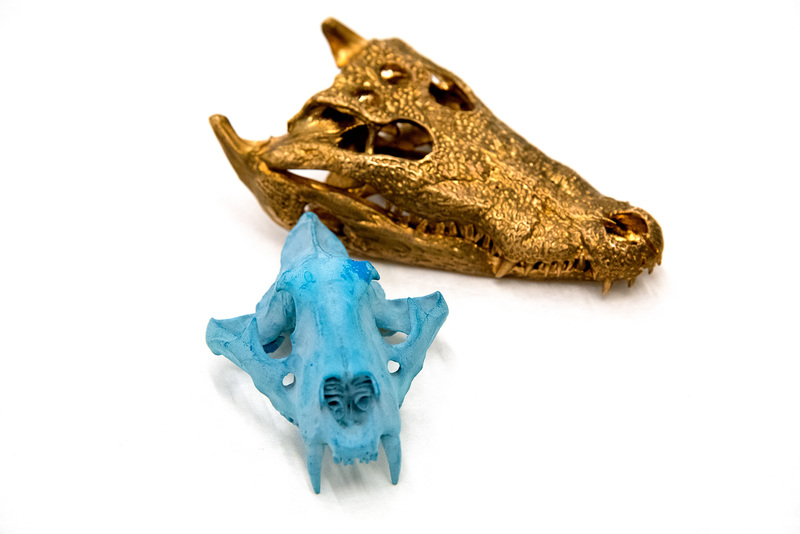 When thinking of 3D printing, many people picture small trinkets made of a meltable plastic. However, the world of 3D printing has expanded beyond the confines of plastics and includes various new 3D printing materials, with many more on the horizon. In some cases, the modern 3D printing process combines with age-old techniques to produce something amazing. 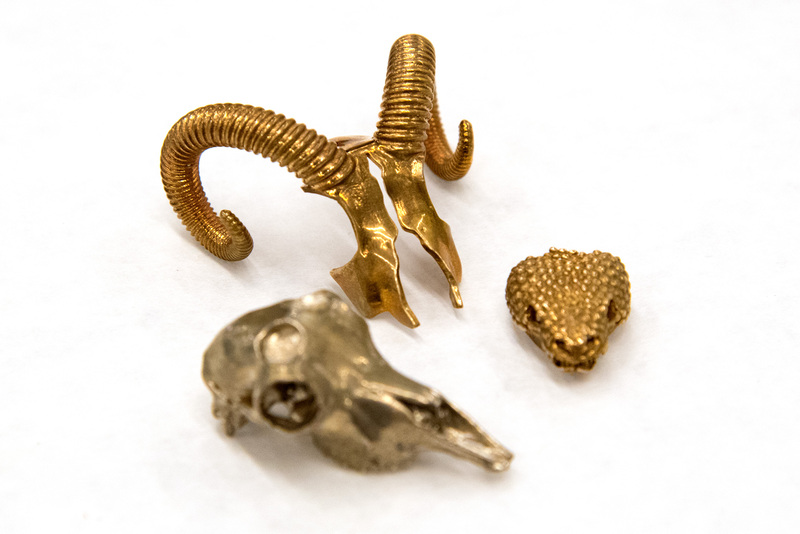 Through a time-consuming and fascinating process, it is possible to “print” metal objects. 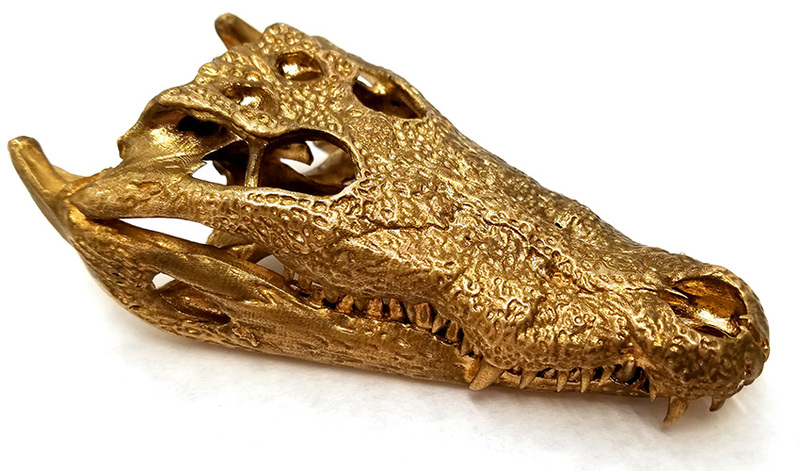 From conception to the final, shiny result, here is the life story of a 3D printed, metal object created at NYU’s LaGuardia Studio. The first step to printing anything, regardless of material, is deciding what to make. Once the idea is established, fine-tuning and designing it into a detailed digital blueprint can take a few days, depending on the creator’s skill level and the complexity of the object, as the digital rendering of the design has to be accurate in order for the printed object to resemble it. When the computer-generated drawing is complete, the object is ready to be printed using wax. The wax printer uses two different kinds of colored wax. 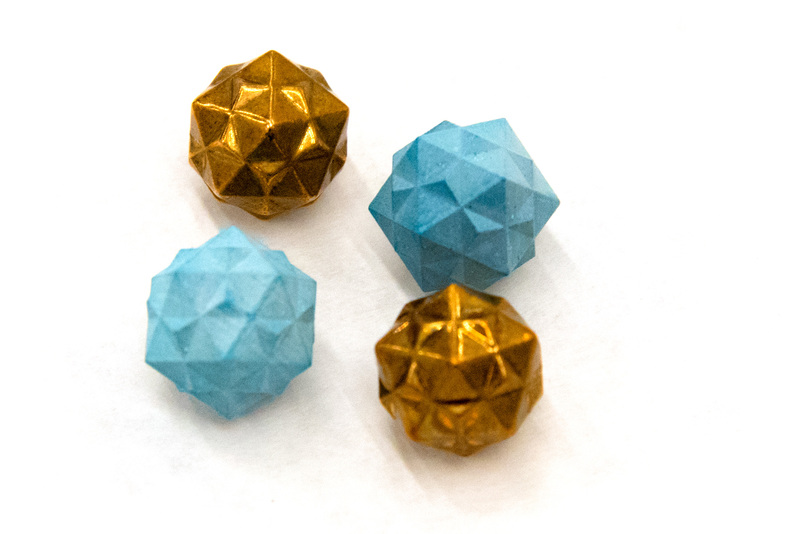 The first is a blue, simulated wax that will become the shape of the printed object. 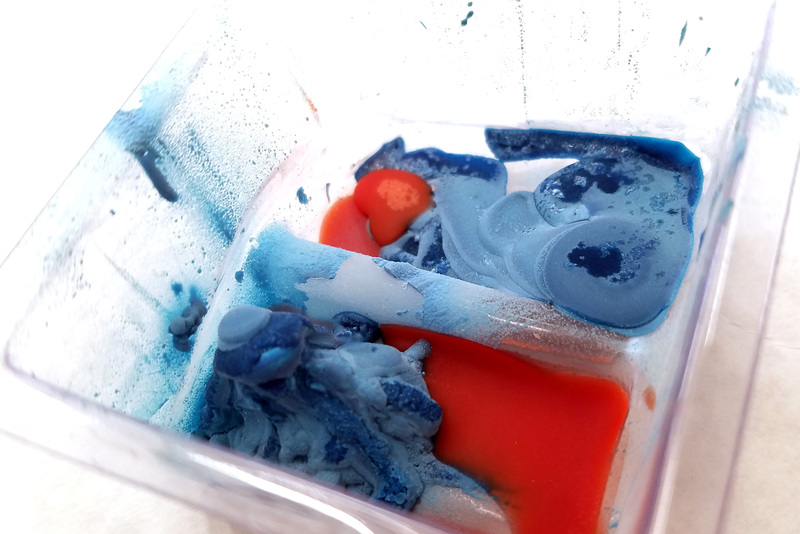 To create support structures that ensure the finished product forms the proper shape, the printer uses a second orange, non-simulated wax with a lower melting point than the blue one. 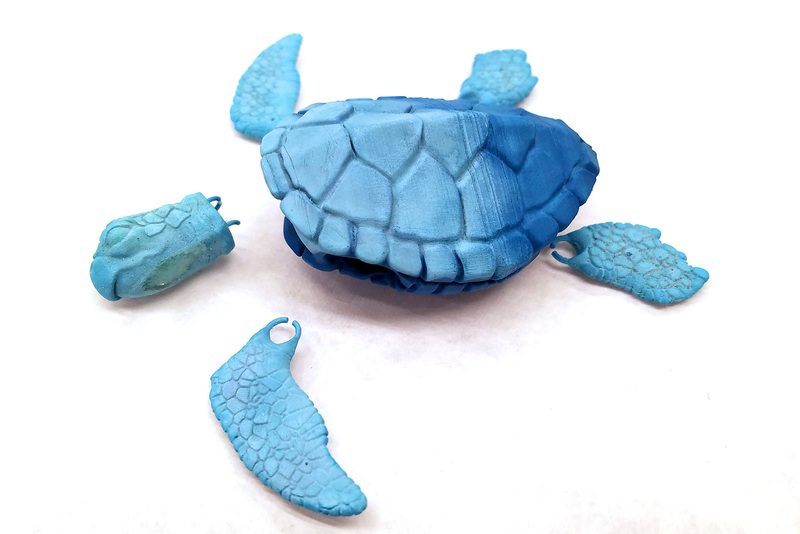 A wax print of a tortoise, ready to be used to make a mold for metal casting. 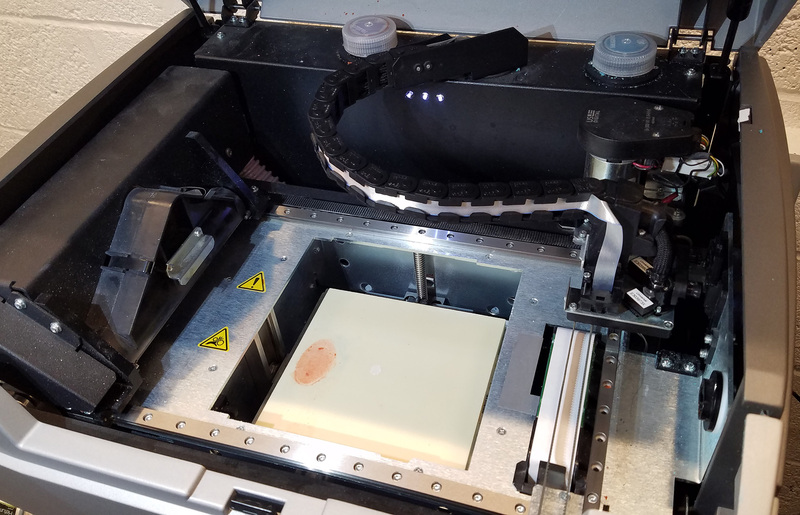 LaGuardia Studio’s Solidscape 3Z 3D wax printer. 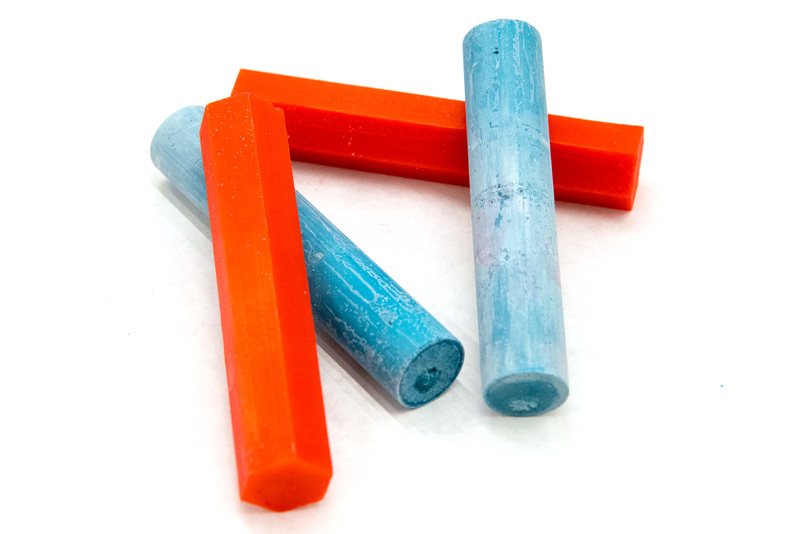 Blue and orange wax “crayons” that are used to create a 3D wax print. After inserting the two waxes (referred to as “crayons” due to their long, cylindrical shape) into the specialized printer, the machine melts the wax into a moldable form that functions as ink or filament would in other printers. As the waxes take shape, a blade at the other end of the machine cuts a sharp edge after each layer of printing. This blade is the reason it is possible to print in such a high resolution. The printer’s jets eject excess wax into a disposal tray called a purge cup to prevent clogging. Dhemerae Ford, LaGuardia Studio’s Senior Advanced Media Specialist and Assistant Technical Lead, remarks that the purging process discards small “stalagmite-looking” piles of wax in the process. As this modern technology prints its shape, one aspect of the printer seems to pay homage to the past: its ticker tape. As the layers of blue and orange wax are laid down and cut, a thin strip of paper slowly spools out of the side of the printer, covered in short blue and orange lines that show the machine is working properly. If the strokes on this tape appear abnormal, it is the machine’s way of telling the creator that something has gone awry with the print. Printing a small wax object typically takes 12-18 hours. It can take as many as six days for larger prints. Once the printer has completed its task, the result is a 3D, wax version based on the computer-generated design, complete with support print material. The next step in the wax-to-metal printing process is removing this support material from the actual object. The orange support wax has a lower melting point than the synthetic blue wax, allowing it to be melted off without harming the print. To accomplish this, the entire object is placed in a warm bath of liquid paraffin oil. The bathing process usually lasts a day or two, but can take longer since melting efficiency is dependent on the temperature of the room. The temperature of the bath, like the room, is also important; if it is too hot, the final print will begin to melt and bubble, distorting its shape and ruining the fine details. 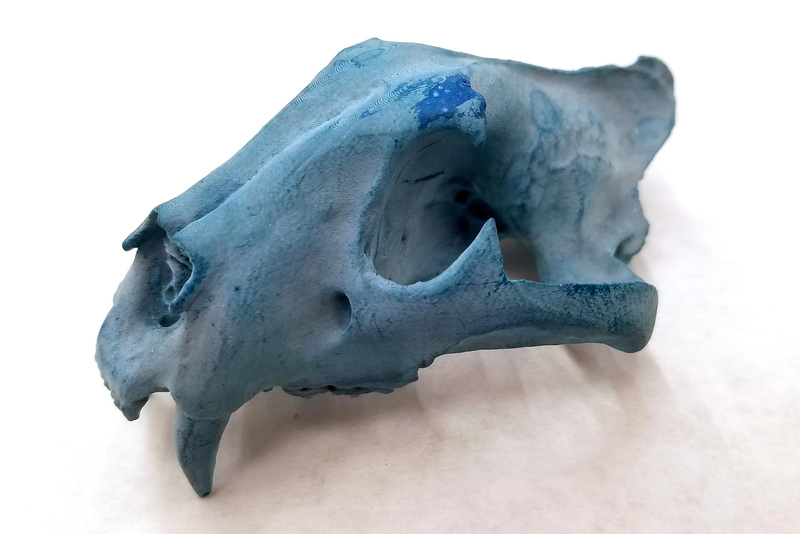 A wax model of an animal skull, also scanned at LaGuardia Studio. Wax run-off from the printing process. Wax prints and the final metal objects cast from the mold. Once the wax model is sent to a metals company, it usually takes three to five days for the process to be completed. The company begins by packing the wax print in cement or hard clay to create an “investment mold” that leaves a small hole. This step involves dipping the wax “into high-grade ceramic slurry…[then dropping] larger particles of ceramic…onto the wet surface to build a thicker coat,” according to PI Castings, an investment casting (also known as lost wax casting) company. Once the hard outer substance is set, the wax model is melted and poured out. The empty mold is then filled with melted, liquid metal and forms an “investment cast,” which is the final metal object. Once the metal print cools, hardens, and is removed from the printer, the surrounding ceramic mold is broken. The print must then be shaped and refined to remove any remaining wax, impurities, and rough edges. Just as wax prints must be put into a paraffin oil bath to remove the support structures, metal prints must go through their own finishing process, which is usually completed by the metal working company or another vendor that specializes in polishing metal. 3D skulls, in wax and metal. 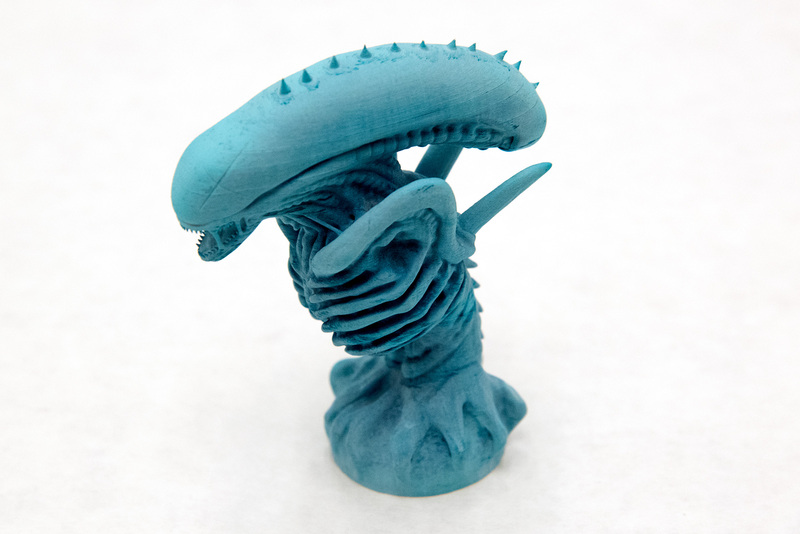 3D printed wax alien from the 1979 movie Alien. Finished metal items, all cast from wax prints. Unlike molten metal, which is simply poured and cooled, but then followed by an extensive ceramic breaking and refining process, the metal powder method is more work upfront, with easier finishing touches. When the machine binds the metal powder together with a laser beam or glue-like agent, the printing phase is lengthy. However, the final clean-up requires merely dusting away excess powder and removing the remaining support structures. Shelly J. Smith, Assistant Director at the Studio, explained that 60 percent of the metal printing currently done at the LaGuardia Studio is used to create jewelry, though there’s significant potential for applying this technology to other areas, including dentistry, medicine, and engineering. While metal printing is still in its early stages, the relatively advanced technology is interestingly juxtaposed with some particularly traditional aspects of the process, such as the progress-marking ticker tape and the centuries-old mold and cast technique. Eventually, these techniques for metal printing will be outdated, much in the same way that the LaGuardia Studio has recently retired their powder printers. More updated and advanced printers are likely to eliminate the need for the molding and casting process by printing directly with metal as current plastic and wax printers do. At present, this process is being streamlined and perfected for use across a variety of scientific and artistic fields. For more information on LaGuardia Studio, including services, consultation, and eligibility, see the LaGuardia Studio website.